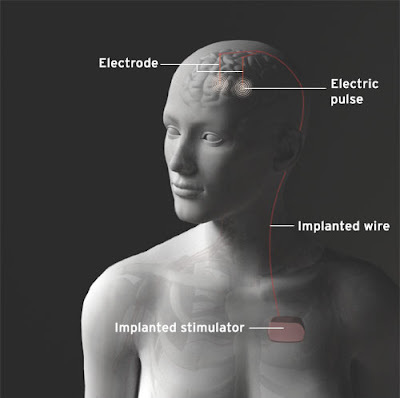 adverse cognitive effects associated with chronic Deep Brain Stimulation (DBS) in Cg25 for Treatment Resistant Depression (TRD) in this sample of 6 patients with a follow-up of 12 months. Several areas of cognition that were below average or impaired at baseline improved over follow-up, and these changes were not correlated with improvements in mood. Broadman Area 25 as target for deep brain stimulation in treatment resistant depression. This area in the brain is from the most important publication about DBS and depression in Neuron march 2005 by Helen Mayberg. This is the location used in the largest trial with DBS in TRD. Other locations for DBS in TRD appear as well but these publications concern individual cases. Functional neuroimaging as well as antidepressant treatment effects suggest that this area plays an important role in modulating negative mood states. Clinical response was demonstrated in 4 of 6 patients using standardized psychiatric end points. These results suggest that modulation of pathological activity in specific limbic-cortical circuits by electrical stimulation of Cg25 can effectively reverse symptoms in previously TRD patients. ECT, no consistent declines in memory for either verbal or visual material were noted after onset or maintenance of DBS over baseline. No as far as I know it is not available in TheNetherlands for TRD. In Amsterdam patients with OCD were treated with DBS.